Modarres Yazdi, M., Shafiei, M., Sahihi Oskooyi, S. (2014). Comprehensive Method to Determine Real Option Utilizing Probability Distribution. International Journal of Research in Industrial Engineering, 3(1), 11-25. M. Modarres Yazdi; M. Shafiei; S.M. Sahihi Oskooyi. "Comprehensive Method to Determine Real Option Utilizing Probability Distribution". International Journal of Research in Industrial Engineering, 3, 1, 2014, 11-25. Modarres Yazdi, M., Shafiei, M., Sahihi Oskooyi, S. (2014). 'Comprehensive Method to Determine Real Option Utilizing Probability Distribution', International Journal of Research in Industrial Engineering, 3(1), pp. 11-25. Modarres Yazdi, M., Shafiei, M., Sahihi Oskooyi, S. Comprehensive Method to Determine Real Option Utilizing Probability Distribution. 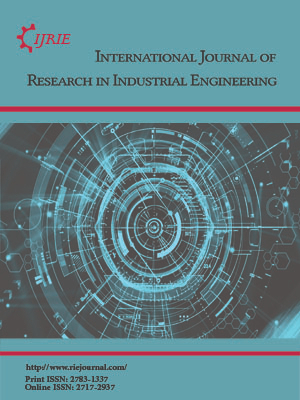 International Journal of Research in Industrial Engineering, 2014; 3(1): 11-25. Department of Industrial Engineering, Sharif University of Technology, Tehran, Iran. Data envelopment analysis (DEA) is a non-parametric analytical methodology widely used in efficiency measurement of decision making units (DMUs). Conventionally, after identifying the efficient frontier, each DMU is compared to this frontier and classified as efficient or inefficient. This thesis introduces the most productive scale size (MPSS), and anti- most productive scale size (AMPSS), and proposes several models to calculate various distances between DMUs and both frontiers. Specifically, the distances considered in this paper include: (1) both the distance to MPSS and the distance to AMPSS, where the former reveals a unit’s potential opportunity to become a best performer while the latter reveals its potential risk to become a worst performer, and (2) both the closest distance and the farthest distance to frontiers, which may proved different valuable benchmarking information for units. Subsequently, based on these distances, eight efficiency indices are introduced to rank DMUs. Due to different distances adopted in these indices, the efficiency of units can be evaluated from diverse perspectives with different indices employed. In addition, all units can be fully ranked by these indices.